When the Defense Department released document 2 in September 2013 it withheld the references to Turkey from the section concerning Nikita Khrushchev's public message to President Kennedy on 27 October 1962 suggesting a trade of U.S. missiles in Turkey for the Soviet missiles in Cuba. In its 2009 appeal letter to the Defense Department the Archive pointed out that Khrushchev message's was in the public record, but the Pentagon maintained the deletions. Washington, D.C., February 21, 2013 – Inane and contradictory declassification actions on military records of the Cuban Missile Crisis indicate serious flaws in the Defense Department's declassification procedures for historical records, according to documents posted today by the National Security Archive. One of the biggest secrets of the crisis was that a deal involving the trade of Soviet missiles in Cuba for U.S. Jupiter missiles then deployed in Turkey, as well as Italy, was central to the diplomatic settlement. While this was disclosed years ago, the Defense Department refuses to acknowledge that the United States had missiles at Turkish or Italian bases. 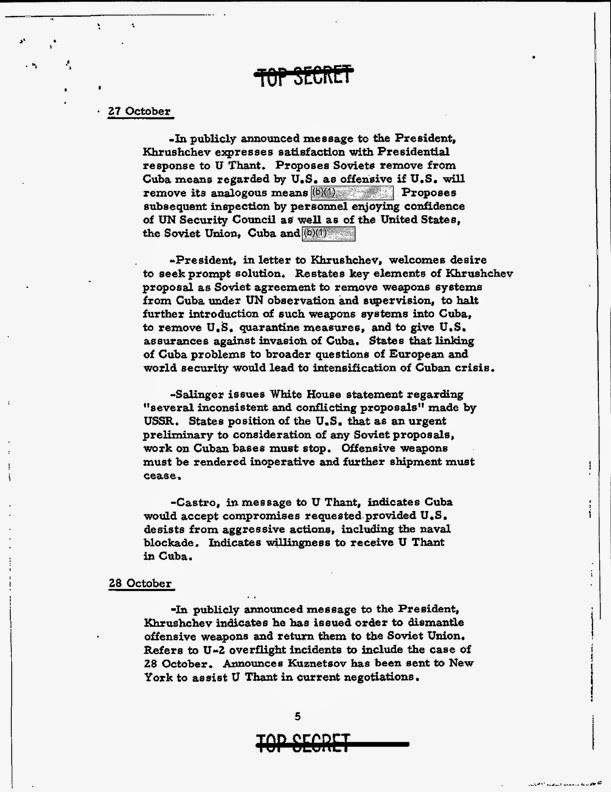 A Pentagon report recently released through a FOIA appeal and published today by the National Security Archive includes several astonishing excisions, including one from Nikita Khrushchev's "publicly announced message" on 27 October 1962, where he proposed removing Soviet missiles from Cuba if the United States "will remove its analogous means from [excised]." [See document 2, PDF page 30] What Khrushchev said was "Turkey," but on national security grounds the Pentagon would not declassify that word in a statement that was made to the world. Another unusual recent declassification decision involves a late October 1962 Joint Chiefs of Staff report on possible military and political operations against Cuba in the event that the negotiations with Moscow broke down. The Defense Department released that report last year in two different versions at the National Archives and Records Administration (NARA), one fully and correctly declassified and the other with significant excisions concerning proposals for covert operations and "provocative actions" against Cuba and Soviet forces in Cuba. Very similar proposals have been declassified before and the fact that a version in Air Force records was declassified in full raises questions about the standards used by the Pentagon to excise the other version. The "Turkey" deletion and the excised JCS report also raise questions about the extent to which Pentagon guidance influences declassification review practices at the National Archives' National Declassification Center. According to a recent NDC report, nearly forty percent of the millions of pages of documents reviewed, most of which are over forty years old, have been withheld on national security grounds. That astoundingly high percentage of exempted pages may include items that the Pentagon regards as "national security information" but which are no more sensitive than the Cuba "secrets" of 1962. Earlier this year, a mandatory declassification review request to the National Archives for Air Force records on the Cuban missile crisis produced a Joint Chiefs of Staff report, dated 28 October 1962, to Secretary of Defense Robert McNamara on "Alternative Actions if Build-up in Cuba Continues Despite Russian Acceptance of the Quarantine." Prepared just as the crisis was ending, but before the Kennedy-Khrushchev agreement had been announced, the Chiefs wanted the White House to be ready for action in the event that negotiations failed and "Soviet offensive weapons are not eliminated." Chairman Maxwell Taylor suggested to Secretary of Defense McNamara a series of "direct and indirect" and "provocative" actions against Cuba (with their pros and cons). The Chiefs had been itching for an air attack and an invasion and may have believed a diplomatic failure would give the Pentagon a chance to take action. Therefore, they proposed indirect measures, such as pressures from the Organization of American States, and direct actions, ranging from an air blockade to covert operations to an all-out invasion. The proposed covert operations included the assassination of "leading Russians and Cuban communists." Moreover, the Chiefs suggested a series of "provocative" actions to induce Fidel Castro "to make a mistake" and give the United States an excuse to launch an attack. Among the provocations were harassments such as destroyer patrols around Cuba and inciting riots on the "Cuban side of the Guantanamo fence" by using base workers as "agents" and providing military aid to them. Such proposals may not be too surprising to readers familiar with the history of the period. An infamous JCS proposal from earlier in 1962, "Operation Northwoods," suggested a variety of wild pretexts, disregarded by civilian policymakers, for a U.S. invasion of Cuba. Declassified by the Kennedy Assassination Review Board, Northwoods included proposals for phony "Cuban" terrorist attacks in U.S. cities and a "Remember the Maine" attack on a U.S. ship. Moreover, actual covert operations against Cuba, including Operation Mongoose and assassination plots against Fidel Castro and other foreign leaders during the early 1960s, were exposed years ago so comparable proposals from the JCS are less than revelatory. In this context, it made sense for declassification reviewers to release the 28 October report [See document 1A] in its entirety earlier this year, in a release of Air Force records on the crisis. The story is more complicated, however, because a different copy of the same JCS report has gone through parallel declassification reviews. The second copy is in a special collection of Secretary/Deputy Secretary of Defense "sensitive records" on Cuba during 1961-1964. It was first released earlier in 2013 in a massively excised form, before the unredacted version in Air Force records had become available. Challenging the excisions, the National Security Archive filed an appeal with the National Archives. As a result of the appeal, reviewers at NARA gave some ground but nevertheless kept significant sections "secret" [See document 1B]. Many of the proposed "provocative" actions were excised along with the covert operations proposals, such as assassinations. The full release of the report is good news; something is working right in the declassification system. Significant deletions in the other copy, however, should be a red flag that something is very wrong. But why the separate reviews produced such greatly divergent results is unclear. Plainly, different Defense Department reviewers assigned to NARA's National Declassification Center reached totally opposite conclusions. One reviewer regarded the information as old hat and properly declassified the report. The other overreacted seeing the report as full of supposedly sensitive secrets and concluded inappropriately that complete declassification would harm U.S. defense and foreign policy interests. NARA staffers may well have objected but under existing rules Defense Department reviewers do not have to listen. Yet it is a waste of resources and a sign of a seriously defective declassification system when reviewers redact 50-year-old documents when nothing about them is sensitive. This is an exceptional case only because it is possible to make direct comparisons. The excisions about the Jupiter missiles in Turkey provide further evidence of a serious problem. In 2009, the Archive filed an appeal on Department of Defense excisions in several documents held in a special collection on the missile crisis among records of the Secretary of Defense. One of the documents was a compilation prepared by Deputy Secretary of Defense Roswell Gilpatric's military assistant, Col. Francis Roberts, on key developments during the missile crisis: political developments, military actions taken, and "national decision-making," with a summary of reconnaissance flights. A number of "secrets" were excised from this document, for example, the "publicly announced" Khrushchev statement on Turkey [See document 2, PDF page 30]. Other references to Turkey were excised, but so was a statement made by Secretary of State Dean Rusk [Document 2, page 17 of PDF] that is nevertheless published in full in the State Department's Foreign Relations of the United States compilation on the missile crisis. Despite the Archive's appeal letter which pointed out the contradictions, the Defense Department's decision, made in September 2013, reaffirmed many of the excisions made in 2009. According to the Defense Department's decision letter, declassifying the information "would cause serious harm to relations between the United States and a foreign government, or to ongoing diplomatic activities of the United States government." It would be interesting to know whether the Pentagon consulted the State Department when it made that ex cathedra judgment. The Defense Department followed the same procedure with other documents released in the same appeal decision. For example, a reference to Turkey (and probably Italy) was plainly excised from hand-written notes on a White House meeting taken during the Missile Crisis by Deputy Secretary of Defense Roswell Gilpatric [See document 3]. These are undeniable examples of over-classification which suggests that the Defense Department's security reviewers follow guidelines that are obsolete and overly stringent. Recently the Defense Department's Inspector General conducted a review of over-classification but rather than tackling substantive issues such as classification guidelines the report focused on small-bore issues such as the use and misuse of classification markings. In light of the pattern of Defense Department practices discussed in this and previous Dubious Secrets postings over-classification remains a problem. Unless it is fixed, neither the Pentagon's civilian leadership nor historians and researchers can be sure that the Department's historical records receive appropriate handling. This problem also raises questions about the proceduresÂ used for reviewing Defense Department documents at the National Archives' National Declassification Center. According to the NDC's first report for 2013, of the backlog of nearly 400 million pages that it reviewed, pursuant to President Obama's instruction to declassify these records by December 31, 2013, the release rate is 61 percent. A very high 39 percent has been withheld for purported security reasons. Some of the pages probably include Restricted Data and Formerly Restricted Data withheld under the Atomic Energy Act and intelligence sources and methods authorized by the 1949 CIA Act. Those are legal, if not always legitimate, secrets; for example, many FRD withdrawals probably relate to historical nuclear weapons deployments long overtaken by events. And the CIA's parameters for what constitute classified sources and methods are always shifting. Moreover, some of the 39 percent may eventually be declassified once interagency coordination has occurred and provisions for declassification of fifty-year old documents have been applied. Nevertheless, one wonders whether the 39 percent includes records which only the Pentagon sees as "national security information" and which are no more sensitive than the Cuba "secrets" of 1962. As for Defense Department documents held in NARA collections, it is time to consider new procedures to ensure that declassification decisions meet the rule of reason. A step forward would be to create a special NDC committee that makes joint decisions on appeals. For example, when the Defense Department claims that declassifying the Jupiter missiles/Turkey nexus would harm U.S. foreign relations, State Department officials could offer a reality check. Unless the Defense Department develops more credible declassification standards, officials at NARA should push for a better process for reviewing appeals involving archival records. Documents 1A-B: Different Versions of JCS Report on "Alternative Actions"